Solar Generators have the capacity, mobility & reliability needed for emergency backup & off-grid electricity at work or home this storm season. After Hurricane Sandy, and even Hurricane Irene the year before, our phones were ringing off the hook with people in need of emergency backup power systems for their homes and businesses -- general manager of TheInverterStore.com Mike Shepherd said. The new 2500 watt solar generator by AIMS Power comes fully-connected as an all-in-one power system, and it’s assembled in America to be a solution for emergency backup power and sustainable living. A solar generator is the perfect answer to hurricane season, which during 2012 left more than eight million homes without power in the United States and during 2011 caused more than 9 million power outages in the Caribbean, U.S. and Canada. It’s now time to prep for this year’s storm season, because it started early with the coming of tropical storms Andrea and Barry, which hit during early June. Tropical Storm Barry left more than 26,0000 homes without power in Mexico’s state of Yucatán, flooded 60 homes and affected 300 people in Honduras and displaced 54 people living in Hope Creek, Belize. This solar generator can provide the backup electricity needed in the event of an outage with two 12 volt, 100 amp hour deep cycle batteries that come connected in series to create a 24 volt battery bank that stores up to 100 amp hours of DC Power. “After Hurricane Sandy, and even Hurricane Irene the year before, our phones were ringing off the hook with people in need of emergency backup power systems for their homes and businesses,” said general manager of TheInverterStore.com, Michael Shepherd. “We could barely handle all the requests between explaining which products would be needed and how to connect them all in harmony to create the power system." The storage, combined with the 2500 watt power inverter included with these solar generators, makes the system powerful enough to run some lights, a refrigerator, space heater, sump pump, and more for several hours or even days if the electricity is delegated sparingly. 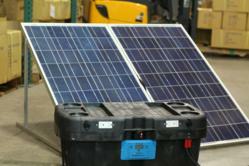 Batteries can then be recharged using easily deployable 240 watt solar panels that are included. The solar generator can be purchased with two, four or six solar panels, and even if the sun covered is by clouds, the panels will still absorb a charge for the batteries. Harnessing the energy of the sun means that in the event of an outage, users are able to stay safe in their homes while harvesting usable power. However, the product can also be purchased without solar panels since the batteries can be recharged using the 30 amp 24 volt smart battery charger (AC to DC converter) included in this unit. This allows charging of the batteries wherever AC electricity is available. The alternative to a solar generator, which is a gas powered generator, is far more expensive, much noisier, requires more maintenance and pollutes the Earth. When deciding on an option for off-grid, backup and/or mobile electricity, this solar generator by AIMS Power proves to be the most lucrative and responsible option available on the market today. Doing our part to help reduce environmental footprints worldwide by selling DC to AC inverters*, inverter chargers, solar panels, solar charge controllers (MPPT & PWM), batteries, cables, transfer switches, fuse kits, & power accessories — everything needed to create & sustain a mobile and/or off-grid power system. The Inverter Store prides itself on customer service, treating every customer with the utmost respect & courtesy, because creating a power system can be a hefty task. A big point of emphasis for The Inverter Store is commitment to technical support, whether that means providing solutions to problems for current or potential customers. TheInverterStore.com has opened all platforms of communication possible to ensure that it’s the most accessible company on the web when it comes to power inverter information. Facebook.com/InverterStore, Twitter.com/InverterStore, The Inverter Store Pinterest & Google+ have all proved to be viable resources for our customers. The Inverter Store Blog contributes to the conversation as well. Inverters or inverter chargers transform direct current (DC) power, like the kind produced by batteries, into alternating current (AC) electricity that can be used to power a wide variety of appliances, tools and/or machinery from anywhere on Earth. This can also be achieved with a fuel powered generator. However, gas and diesel powered generators are a serious pollutant to the environment, producing harmful gases and toxic waste that is sometimes left onsite. It’s especially alarming because most fuel generators are being used in the more desolate places on around the globe — places that should be kept beautiful and untouched by these harmful chemicals created by generators.